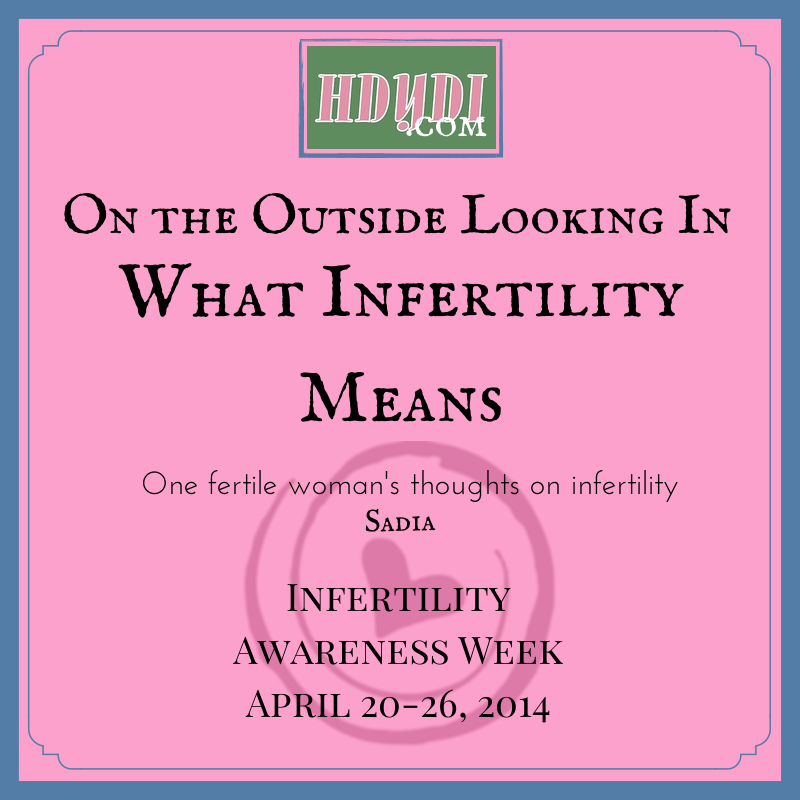 Sadia’s Perspective — On the Outside Looking In: What Infertility Means | How Do You Do It? I don’t really know what infertility means. I know the science and biology of it. I’ve witnessed the emotion and pain of it. But I’ve never experienced it. I don’t really know. When we at How Do You Do It? 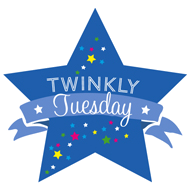 decided to put together this week’s posts, to lay bare how infertility is a very real part of mothers of multiples culture, I volunteered to coordinate things. Because that’s what I do. As I sat down to write the post calling for submissions, however, I found myself stumbling. Instead of the smooth way in which the words usually pour out when I’m blogging, I found myself writing in pained spurts. I was pondering the right words, getting up close and personal with the Backspace key, even folding laundry, hoping a break would bring me the right way to phrase what I was trying to say. I needed words that acknowledged the uniqueness of each infertility experience, the sense of kinship within the infertility community. The fact is, though, that I’m not part of the club and will never really understand. Then I realized that it’s because I’m not part of the club that I don’t have the words. As a mother of multiples, terms like “singleton,” “NICU,” “mono/di” and “fraternal” just slip off my tongue, but I’ve never really lived in the infertility world. So I did my best as an outsider. No, that’s not right. Suffering is a passive state. I know many of these men and women. They’re fighters. That doesn’t work either. 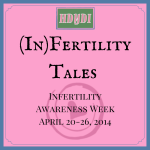 Do you fight infertility? Treat it? What about parents who went straight to adoption after trying to conceive didn’t take? They accepted infertility for what it was and came up with a Plan B.
Ew. No. Being infertile isn’t a core human characteristic, like being blonde or short. Okay, Sadia. You’re a wordy kind of girl, but this is getting ridiculous. And is the past tense even appropriate? Do you really stop living with infertility when you finally have your child? Do you begin to consider yourself to be in the fertile camp? Are “parent” and “infertile” opposites? I imagine that for some parents, they are. For others, they’re not. That’ll have to do. It gives infertility too much agency, but perhaps that’s right. Perhaps infertility becomes the third wheel in the relationship. And “journey” is good. It doesn’t require an end to have been reached yet, but allows for it. Walking around the world as a mom of twins, it’s impossible to be unaware of infertility. Even if I never hung out with other MoMs, the strangers on the street would never let me forget. “Are they natural?” they ask, so often. It’s such a loaded question: “Are they natural?” I know it comes from a place of curiosity. I know it comes from a vague knowledge that fertility treatments have led directly to an increase in multiple births. I know they don’t mean to ask whether I’m part of the Infertility Club. If they knew anything about the Club, they would have chosen different words. Because children conceived with medical assistance are as natural, as miraculous, as extraordinary as my spontaneous little ones. I don’t even know what to call myself. I don’t know what those of you in the Infertility Club call those of us on the outside. What do you call those of us who conceive spontaneously, easily, some even by accident? I can love you. I can support you. I can cry with you. I can even lend you my womb. But I will always be on the outside looking in. Stunningly honest post. Thank you for coordinating this blog series this week for NIAW and also for your candidness to be outside looking in. The compassion is much appreciated. A lovely post – definitely sharing. Thank you. Looking forward to getting to know you better through your blog!